Today, eating mass amounts of food is nothing particularly special. The world of competitive eating is even centered around eating ridiculous amount of food. However, aside from all those non-competitive eaters in the poorer parts of the world, most modern gluttons don't know the true meaning of insatiable hunger, at least not to the extent of one medieval Frenchman. While demonized for being a cannibal, a crime against nature that is certainly hard to accept, this man painted monster by history is a victim of circumstance and disease. This is the tale of Tarrare. He was a man and he was very hungry. In the early 1770s, the exact date lost to time, a child was born that would grow to be more monster than man in the Rhone valley. Even in his earliest years the boy demonstrated a voracious appetite. He could easily eat amounts of food that could kill a normal man, noted to beable to eat his own weight in food in a single day while still having room for dessert. However, when he reached his early teenage years, his parents drove him out. Perhaps they could no longer endure having such a strange child, but more likely they could no longer afford to sate his appetite. It is said that this boy took up with a band of roaming thieves and prostitutes where he would beg and steal food in order to live, never quite being full. However, upon arriving in Paris, he stuck out on his own as the street performer where he took up the name Tarrare. Tarrare has come to be known as a French term for flatulence, but it also could refer to the region of Tarare in the Rhone area, referencing where he is born. It is often thought Tarrare was a stage name, but no one is quite sure. Tarrare's odd eating habits quickly captured the crowds in the city. He would regularly draw crowds by swallowing odd objects like corks, stones, and live animals. During his time performing on the street, he grew particularly fond of snake meat, which was lucky considering nothing drew a crowd like crushing a live snake head with your teeth and sucking it down like a noodle. While Tarrare was a successful street performer in Paris, his odd eating habits were not without consequence. He was frequently hauled to the Hotel-Dieu Hospital by members of the crowd after suffering from severe intestinal obstructions where he would undergo wasting with powerful laxatives. Unfortunately, these painful occurrences were not enough to dissuade Tarrare. On one occasion, after he recovered, Tarrare offered to eat the doctor's gold watch and chain to entertain him as payment. The doctor, unamused, declined and said if he did so, he would be forced to cut the objects out of him. When the War of the First Coalition broke out in 1792, Tarrare was drafted into the French Revolutionary Army alongside all the other young men ranging in ages from 18 to 25. However, military life was a poor match for a man with his appetites. With military rations unable to satisfy his appetite, Tarrare took to trading duties with lazier soldiers for their share of the rations and, in more desperate times, scavenging in the refuse for edible scraps. Even then, the food he could procure was not enough to sustain him. After suffering from extreme exhaustion, he was admitted to the Soultz-Haut-Rhin military hospital. The doctors there were able to provide quadruple rations, but even then he remained hungry. While at the hospital, Tarrare was afford more opportunities to scavenge food. He returned yet again to the gutters and refuse containers, but this time he was able to scavenge scraps from other patients, steal and eat poultices from the apothecary, and at times he would be found in the morgue. The military doctors were absolutely baffled by his hunger, yet, at the same time, intrigued by it. Under the orders of surgeon to the 9th Hussar Regiment, Dr. Courville and Surgeon-in-Chief at the hospital, Baron Percy, Tarrare was temporary removed from military service so they could test his eating capacity. By this time, Tarrare was typically restrained around food that wasn't his, but in order to fully test his capabilities, the doctors left a meal enough for 15 men within his reach. Tarrare consumed two large meat pies, four gallons of milk, and even the entire platters of seasonings that included grease and salt. Afterwards, he fell into a deep sleep. On a different occasion, Tarrare was presented with a live cat. After being no stranger to consuming live animals for show on the streets of Paris, Tarrare ripped it open, drank its blood, and ate everything save for the bones. He would later vomit up skin and fur, not unlike an owl. The hospital would continue to feed him live animals and great masses of food trying to determine what caused the hunger and what would fill him, but the studies were inconclusive. However, after several months of experiments, Tarrare returned to active duty. However, trying to do his part for the war effort, Dr. Courville took Tarrare's unique abilities to General Alexandre de Beauharnais. The doctor suggested that Beauharnais use Tarrare's impressive stomach to secretly smuggle messages in and out of Prussia. Intrigued, the general wanted to see Tarrare's ability for himself. A message was written and sealed in a wooden box before being fed to Tarrare. After two days, he passed the message, digging it out of his excrement and presented the still legible document. Impressed, Tarrare was given a wheelbarrow full of 30 pounds (14 kg) worth of bull lungs and liver as a reward. This showing, including the consumption of the entire wheelbarrow of organs in front of the generals, sealed Tarrare's fate as a spy. Although the voracious eater proved he could consume the message, Beauharnais was still concerned with the soldiers' state of mind. One his first official mission, Tarrare was tasked with sending a secret message to a prisoner in Prussia outside of Neustadt. However, instead of putting in a real message, Beauharnais simply asked for confirmation that the message was received and any information the prisoner may have obtained. Tarrare crossed the border in darkness, disguised as a German peasant. Things might have gone fine, but unfortunately, Tarrare spoke no German. Attracting extreme suspicion from those around him, Tarrare was captured by Prussian forces outside Landau. Stripped naked and searched, the Prussian soldiers found nothing and Tarrare refused to betray his country and his mission, even when marched in front of General Zoegli. The stories tend to vary in some degree after this point. One side suggests that after being imprisoned for 24 hours and starved, Tarrare eventually gave up the information, afterwards being changed to the latrine until he passed the wooden box. When General Zoegli was enraged at the lack of any actually information in Beauharnais's false message, Tarrare was marched to the gallows, ready to be hung before the General changed his mind, beat him, and sent him back to the French. An alternate tale of this time states that Tarrare was able to pass the message before being interrogated by the General, swallowing the document and rendering it unreadable. In a rage, the General attempted to get the information through the mock execution, but eventually realized it was for naut. With his first spy mission a resounding disaster and his previous days as a soldier full of gnawing hunger, Tarrare was eager to escape any further military service. He begged the Surgeon-in-Chief at the military hospital, Baron Percy, to search for a cure for his unusual hunger. Percy tried treatments of laudanum (a powerful mixture of opium, codeine, and morphine), tobacco pills, and wine vinegar, but all attempts were unsuccessful in quelling his hunger. Efforts to keep Tarrare on a controlled diet, believing it was his own habit of over-eating run wild, also failed. While all of Dr. Percy's attempts at a cure failed, Tarrare returned to old habits - scrounging offal from outside the Butcher shop, fighting strays for carrion in the gutter, drinking blood from patients undergoing bloodletting, and attempting to break into the morgue. While most doctors believe Tarrare was mentally ill and called for his transfer to an asylum, Dr. Percy continued to try and help him. However, when a 14-month-old child disappeared from the hospital, there was nothing Dr. Percy could do to help him. The hospital staff chased him away and Tarrare would never return. The next four years of Tarrare's life are a mystery, but as Baron Percy was invited to a hospital in Versailles in 1798 to visit Tarrare, it is suspected that he kept up the search for a cure. At Versailles, Terrare was now weak and bedridden. He believed that a golden fork that he swallowed some time earlier was responsible for his current state and asked Percy to fish it out. However, upon closer inspection, he discovered Tarrare suffered from advanced tuberculosis. A month later, after a bout of diarrhea filled with blood and pus, Tarrare died at the age of 26. When Tarrare first arrived in Paris at the age of 17, he was described as average height, but abnormally thin. Throughout his life, he only weighed around 100 pounds (45 kg), but it fluctuated widely as he ate. Described with heavily stained brown teeth, lips that were so thin they were nearly invisible, and abnormally soft hair, he must have been a sight to behold. However, when his shirt was removed, Tarrare was said to have a fold of skin that he could actually wrap completely around his abdomen as well as wrinkled, flappy cheeks that hung from his face. The extra skin on his face also allowed him to fit an incredible amount of objects in his mouth at a time. Some stories state he could hold a dozen eggs, while others suggest it was a more impressive dozen apples. During his time at the hospital, the doctors made note of his physiology. His body was hot to the touch and the man sweated frequently, suffering from a constantly foul odor about his person. However, while his body odor was enough to repel most people, the diarrhea he frequently suffered was considered absolutely unbearable in smell. While overall Tarrare was an odd looking man, he only grew stranger looking after he ate. His eyes and cheeks would become bloodshot and his stomach would distend like a balloon. The smell that hung about his person would grow worse after eating vast amounts, and he would either fall asleep or go into a trance in which he sat belching obsessively and swallowing. Even after eating obscene amounts of food, Tarrare would neither vomit nor gain any weight. In fact, he was in a constant battle to keep his body from eating itself throughout his entire life. While Tarrare's story states that General Beauharnais was concerned about his mental state, suggesting some sort of instability, the doctors recorded that he was actually a fairly stable man. Apart from his eating habits, he displayed no unusual behavior and had an understandably apathetic outlook. His general apathy was likely what made Beauharnais so hesitant, believing that Tarrare would not be loyal to his country if caught. After Tarrare's death, the Dr. Percy as well as the doctors at Versailles could not wait to do an autopsy, and it is good that they didn't. The remains of Tarrare rotted at an advanced rate with a smell that made many surgeons refuse to work on it. However, when Percy cut him open, they found that Tarrare had an abnormally large esophagus and when his mouth was opened, they could see clear into his stomach. His chest cavity was filled with pus and his liver and gallbladder were abnormally large. As expected, his stomach was huge, taking up most of his abdomen cavity and crushing his intestines together under its size. At the time, his stomach was also covered in ulcers. The gold fork that Tarrare believed he had lost in his body was never found. So what was wrong with this very unfortunate man? The truth is, no one knows even to this day what was wrong with Tarrare. There were other stories of this type of hunger at the time, including the cases of other Frenchman like Antoine Langulet and Charles Domery, but their extreme hunger was also a mystery. In modern medicine, hyperthyroidism has been found to cause extreme appetite as well as Tarrare's other symptoms like increased sweating, fine hair, and rapid weight loss, but never to such extents. It is speculated that Tarrare and other men that exhibited such hunger may have suffered a badly damaged amygdala. Located deep inside the temporal lobe, the amygdala is responsible for processing m emories and decision-making, but it most well known for controlling emotional reactions. As an apathetic man, a damaged amygdala may have been the cause. This theory is made even more convincing as damage to the amygdala has been found to cause polyphagia, the scientific term for excessive hunger, in animals. Just as we may never know what exactly was wrong with Tarrare, we will also never know if he truly deserves to be counted among the ranks of the world's most heinous cannibals. The description of his acts and physical appearance certainly paint him as quite the monster, but for those who have known, at very least, how it feels to go to bed hungry; perhaps they can understand him a little more. Hunger can be maddening and, in time, will cause anyone to do desperate things to make it go away. What to learn more about Tarrare and others with mysterious ailments? Tarrare and many others are detailed in this surprisingly intriguing book. This tale is both fascinating and horrifying at the same time. It seems as if there must have been a medical cause for his hunger. Thyroid disease? A tapeworm? I guess we'll never know. BTW there was a TV personality in Japan a few years back, a tiny young woman who could eat literally piles of food and never get fat. I believe she was lacking a section of her intestine (presumably the part responsible for absorbing the nutrients from food). That's fascinating, too! Tarrare's organs were in such poor shape and medical knowledge at the time was so limited that I doubt the doctors would have noticed if he was missing parts of his intestines, but that would've explained a great deal of his condition. 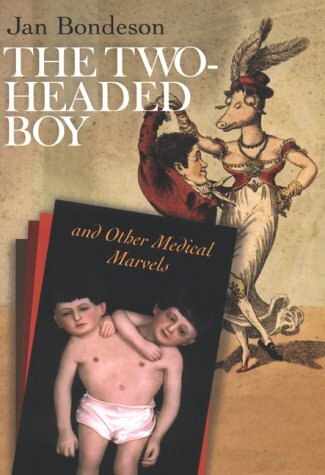 Jan bondeson The Two-headed Boy, and Other Medical Marvels . Ithica: Cornell University Press, 2006. J. G. Millengen Curiosities of Medical Experience . London: Richard Bently, 1839.